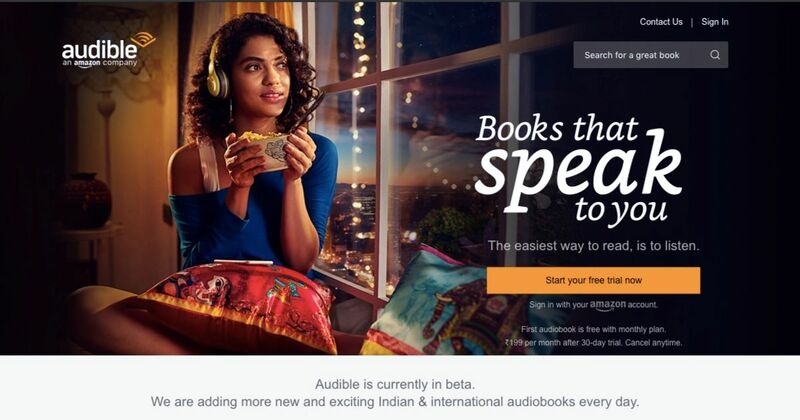 Amazon’s subscription-based audiobook service, Audible, has arrived on Indian shores. Users will be able to access a catalogue of over 200,000 audiobooks, plus Amazon has promised to “add more Indian & international audiobooks” on a daily basis. To begin with, Audible is offering a 30-day free trial to new subscribers and and a 90-day free trial to Prime users. Post completion of the trial period, users can subscribe to the service on a monthly, half-yearly and yearly basis at prices of Rs 199; Rs 1,345 and Rs 2,332, respectively. As part of the plan subscribers will get one free credit every month, which can be availed towards any title that’s part of the Audible India catalog, regardless of its price. The audio books get added to your book catalogue without any time cap. Even if you cancel your subscription in the coming months, the books you’ve downloaded will remain in your Audible library for future access. You can even return an audiobook if you don’t like it or exchange with another one. Apart from this, Audible members will be able to purchase additional audiobooks at a 30 percent discount compared to their usual rates. And in case you don’t use the given free credit in a particular month, it will roll over to the next month. You can accumulate as many as six credits at one time. Users can listen to these audiobooks through the Audible iOS and Android app or through Amazon Cloud Player on the Audible website. Book categories on the app include fiction, sci-fi, fantasy, romance, mysteries, young adult, spirituality, biographies, business and self-development among others. And it also offers curated lists such as ‘Great First Listens’, traditional bestsellers and new release section making it easier to discover new audiobooks.